Pip Wilson bhp: Pharrell = NERD - "We believe in inclusivity." 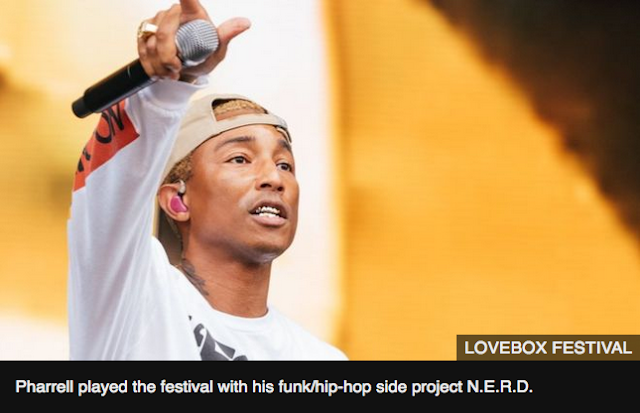 "We stand for the resistance," says Pharrell Williams, playing London's Lovebox festival as US President Donald Trump makes his first official visit to the UK. "They came to your country because they want to divide you but we don't believe in that. We believe in inclusivity." The star was one of several US acts who urged UK fans to resist the rising tide of right-wing politics. "We got to fight that stuff," said Saturday's headliner, Childish Gambino. "I know it's scary - because we know what happens to people who fight. But we got to stick together." The star, whose provocative single This Is America is one of the most politically-charged records of the Trump era, also praised the protests taking place in the UK this weekend.